In 1760 George Washington recorded the receipt of an invoice dated December 26th, detailing his latest purchases from London. Therein he listed "A pair 3 dropt Garnet Earings" bought from a jeweler named J. Grymes to grace the ears of his wife, Martha. 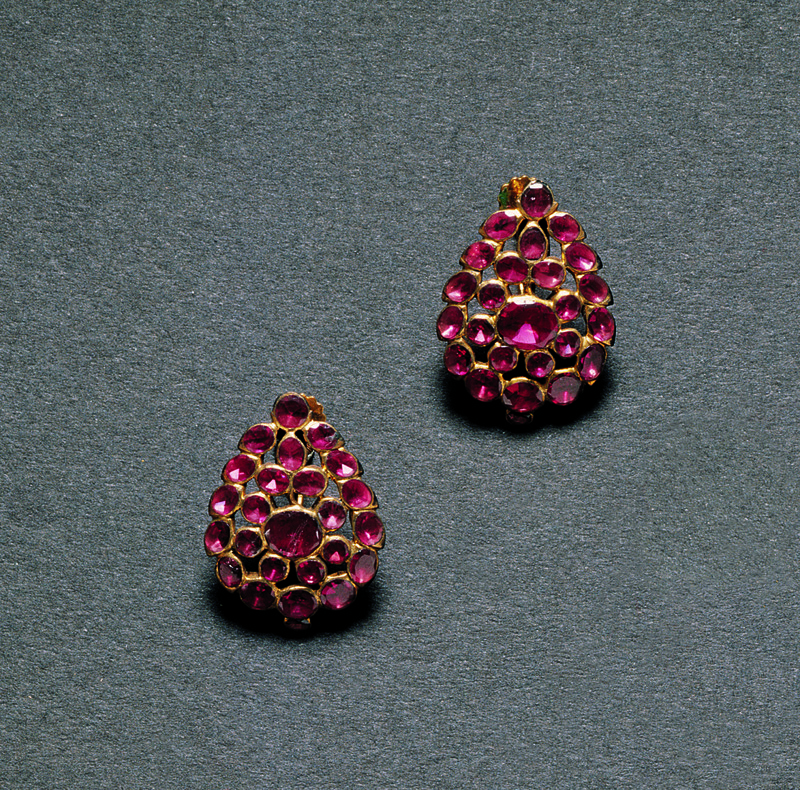 In the eighteenth century, "dropt" earrings referred to earrings with removable dangling pendants. As garnet jewelry remained popular throughout the eighteenth, nineteenth, and twentieth centuries, few pieces survive in their original state. These drop pendants were later altered into a pair of earrings. Earring made from a drop pendant of twenty-five garnets set in gold-washed silver. The earring is adorned with a seven stone flower cluster surmounted by a trefoil of garnets that are encompassed by a wreath of fourteen gems. A single stone juts out from the base. Attached to the obverse is a screw-back earring closure. Each gem is backed with foil in a closed setting. Earring made from twenty-five garnets set in gold-washed silver. The earring is adorned with a seven stone flower cluster surmounted by a trefoil of garnets that are encompassed by a wreath of fourteen gems. A single stone juts out from the base. Attached to the obverse is a screw-back earring closure. Each gem is backed with foil in a closed setting.